The Human Design System is the Science of Differentiation. It shows each of us that we have a unique design and a specific purpose to fulfill while on Earth. Endless possibilities for individual uniqueness lie within our genetic matrix. There are millions of variations of human beings, yet each of us has a specific and unique Human Design configuration with a clear Strategy that effortlessly aligns us to our uniqueness. Human Design does not ask you to believe anything. It invites you to participate in a potentiallylife-transforminglivingexperiment,and providesyouwith the practicaltools and information needed to live life as yourself Without this individualized - and individualizing - living experiment, Human Design is just a complex system of fascinating information to entertain the mind. In looking at thousands of charts, one thing stands out – no two are exactly alike. Even if someone had a chart very much like yours they would not be you. But how do we determine our unique design? 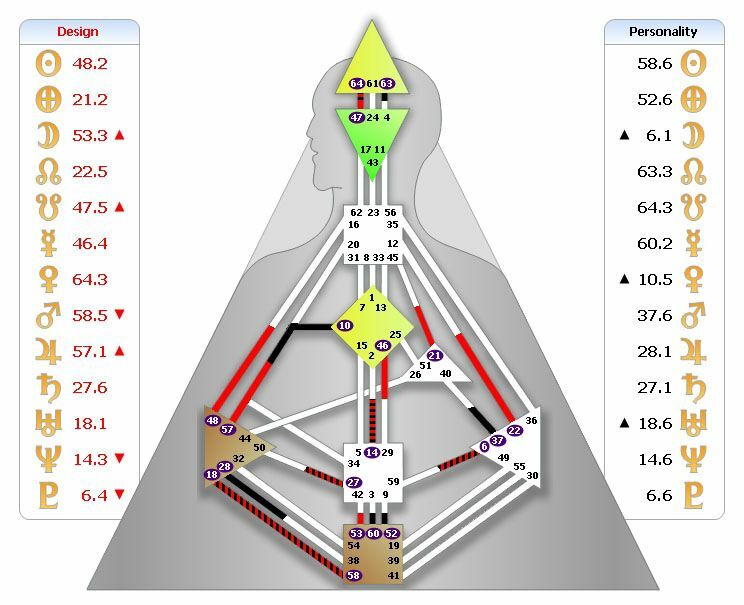 A Human Design Chart or BodyGraph is a precise map and user guide that gives you access to how we are genetically designed to engage with the world, and how our unique inner guidance system operates. Never before have we been able to see all of the parts of ourselves so clearly. The conscious and unconscious parts of ourselves, the aspects of us that no one can take away from us, as well as the aspects that we have been taught or conditioned to believe are us, but are not. As Ra Uru Hu, the Founder of Human Design, has often said, “What you can rely on you’ve never relied on in your life. What you can’t trust you’ve been trying to trust all your life. What you’ve been trusting has never been you. What you’ve been ignoring has always been you. Try to trust what’s really you and see what happens.” Each of us is meant to be different from everyone else. Now we can see and get in touch with those differences. We are here to live our lives and express our truths in our own unique ways. Understanding this can lift a great weight from our shoulders. How often have we compared ourselves to someone else? How often as children were we compared to someone else by a parent, teacher or peer? Comparing ourselves to others creates an impression deep inside of us that it is not okay to be who we are. When we add that to the conditioning of our early years, we find ourselves trying to change or adapt how we act to suit others, which further distances us from the person we were born to be. When we begin to understand and accept our own uniqueness, something inside of us opens up and relaxes. The layers and layers of conditioning slowly fall away, and the person we were meant to be, our inner essence, begins to emerge. Your chart shows your specific genetic design: affirming who you really are, how to be yourself, and how to navigate successfully through a constantly changing world. It provides you with the tools you need to live an aware and awake life – a simple Strategy you can trust that reliably connects you to your personal Authority in order to make moment-to-moment decisions that are correct for you so that your unique life purpose can unfold naturally. Your Strategy will help you eliminate resistance (frustration, anger, disappointment, bitterness) and fear in order to live in a relaxed, unique, creative and evolutionary/revolutionary way. Your chart maps out your relationship dynamics to help you understand how the attractions, resonances and conflicts between you and others play out. It gives you guidance on how to align yourself with people who enhance your vitality, support your life purpose, and share your true path. 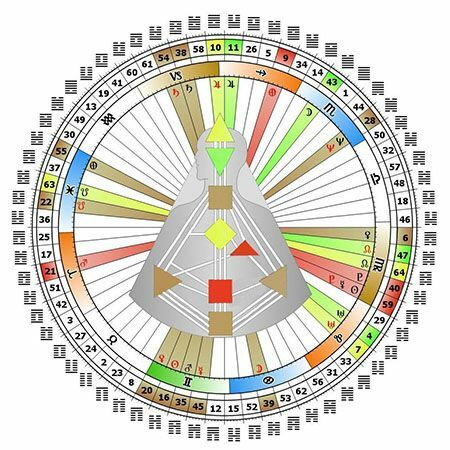 Understanding the charts of others illustrates the truly unique and individual natures of those close to you, like family and friends, and how best to respect and interact with them. Most importantly, a chart shows us how to create the best environment for children so that they are empowered to be their unique selves, and to learn and develop as individuated human beings. Your chart gives you your Type, Strategy, and Authority (body-centered intelligence) tools to show you the way you are designed to navigate through life and interact with the world. While there are millions of variations of designs, there are just four Types of human beings. Each of us is one of these Types, and your Type stays the same throughout your entire life. Here is a very brief explanation of the Four Types. , represent about 70 percent of the population. Their Strategy is to engage with life by waiting for things to come to them so that they can respond. When they initiate rather than wait to respond, they usually end up feeling frustrated. Generators are the life-force of the planet and are designed to know themselves by observing what they respond to. Through responding they experience satisfaction in their life and work. Their work is their gift to the world. , compose about 9 percent of the population. Their Strategy is to inform others of their decisions before they take action in order to eliminate resistance. When Manifestors cannot manifest in peace, they experience anger. Manifestors are designed to have a powerful impact and be initiating mechanisms for the other Types. Initiating is their gift to the world. , are approximately 20 percent of the population. Their Strategy for engaging with life is to wait for their specific qualities to be recognized and invited into things. It is through an invitation that they experience recognition and success in their lives. If they initiate rather than wait, they experience resistance and rejection and can end up becoming bitter. The Projector’s gift to the world is to understand and be a guide for others. , represent approximately 1 percent of the population. Their Strategy is to wait through a full cycle of the Moon before making major decisions. Reflectors delight in life’s surprises. When they initiate and don’t use their Strategy, they end up disappointed with life. Reflectors are designed to be the judges of humanity, to reflect back the injustices humanity inflicts on itself. Their ability to clearly discern the ‘this and that’ of the world is their gift. The heart and soul of The Human Design System lies in the potential awakening that is available to you through the actual living of your unique design. Strategy and Authority, which will be explained in detail later in this book, are the doorways to living as yourself, affirming who you really are, and understanding and letting go of what you are not. In the past we navigated life with our minds as the ultimate decision maker. Our minds are not equipped to do this for us any longer. The mind’s real genius is for collecting information and experiences, measuring this against that, and contemplating unique perceptions and reflections that can be shared with others. It can only do this, however, when it is not making decisions for us. The mind is now at its best as a passenger – here to watch the movie and to view the scenes of life as an involved observer. What actually moves us through life on our unique path is the superior consciousness or intelligence of our body, the form we inhabit. The Human Design System is the revelation of how our form works, and how it becomes the guiding source of our personal Authority. We are each designed with a unique way to make decisions with our body consciousness, and every decision is critical as each one moves us along life on a particular trajectory. One wrong decision can set our life on a course that can have serious consequences. Mental decision-making is rarely more than a 50/50 guess, and the mind is not a trustworthy personal guidance system. To survive on this planet, we each need to know how to access our own Authority. It is the decisions that come from deep within that either put us back on or keep us on the correct path for our life, empowering us to live life authentically from our personal truth. The Human Design System’s tools for awakening are like no others. Once you are familiar with your unique design and learn how to use your Strategy and Authority effectively, you can immediately begin to experiment with and discover for yourself how they transform your life. By living as you are designed to live, as yourself, your mind starts to play a much different and more appropriate role as an objective observer and resource, freeing you to experience what it is to be an awake and aware passenger. Your mind participates in your process of self-discovery but does not interfere with your day-to-day decisions. Human Design gives you the tools and points the way, but it’s up to you to use them. Throughout Human Design we compare the authentic (or true self) to the not-self. When we talk about the authentic self or true self we mean our pure and natural behavioral nature designed to emerge without resistance into the world. Another term used for this is our purpose, our reason for being here – being the person we were born to be. The not-self is conditioned programming masking our authentic self. As we become aware of our not-self through our Strategy and Authority, we slowly become aware of our authentic self always present, but concealed just behind it. Self-hatred also has its source in the not-self; we simply hate our failure to fulfill the layers and layers of expectations that we have taken on or placed on ourselves. When we know and accept – and live – from a comfortable place of authenticity, we will naturally come to love ourselves. As you journey further into your personal experiment to know yourself, you will witness every possible variation of your not-self conditioning and the resistance it creates. The more clearly you see that, the more clearly you will see your true self. Knowing yourself is the path to loving yourself. The Human Design System shows you how. Human Design focuses on the health, stability and direction of our life contained within our bodies. Once the form (body) is functioning optimally, the light of our psyche (Personality) or soul shines through all we think, say and do with an empowering clarity and gentle ease. This is authenticity, living as we were designed to live. Deconditioning, as it is called in The Human Design System, is a process of letting go of what we are not. It is a slow process because it is a deep process. When we re-claim our Authority, changing how we make decisions and navigate through life, we actually change the way our cells function within our body. Life moves in seven-year cycles, as it takes approximately seven years for all the cells in our body to be renewed. The moment we begin to align with our own nature, the moment we allow our body to live its life without resistance, we begin this deep process of deconditioning. Seven years later we emerge closer to the person we were born to be. It is not easy to start as an adult, but as we have heard over and over – it is NEVER too late to begin. As far back as ancient China, thinkers and philosophers espoused the idea of not-doing as a way of doing. There is a pleasant ease that comes from living your life surrendered to your inner guidance system. Being awake and aware of yourself, living authentically and in harmony with your design, is so much more interesting than living asleep and lost in the expectations of the conditioning of the homogenized world. Learning to make decisions from deep within yourself, so that you and others can fully benefit from you being you rather than a carbon copy of someone else, is worth the effort, the time and the patience that it takes to get there. To know your self IS to love yourself. Once we begin living our life authentically through our Type, Strategy and Authority, we can begin to pay attention to whether we experience ease or resistance along the way. When we have acted from decisions made by our thinking minds, rather than our Strategy and Authority, we experience resistance. Continually making decisions from our mind means we are living a life that isn’t ours; and the accumulated stress from such actions jeopardizes our physical, mental and emotional well-being. The not-self themes of Anger (Manifestor), Frustration (Generator), Bitterness (Projector), and Disappointment (Reflector) are signposts of resistance that alert us that we have veered off course by failing to follow our Strategy and ignoring our Authority. In other words, it is our not-self actions and decisions that are resisted, not our authentic selves! If taken personally, we experience resistance as rejection or suppression of our true self by others. On the other hand, when we become conscious and aware of what resistance is telling us through these signposts, it affords us an opportunity to take a step back and reassess our approach/action/words. When we become ill or dis-eased or accident prone, we know that continued outside resistance has manifested on the inside. As our authenticity is lived out, our purpose in life is freed to accomplish its essential mission and brings us our full true-self measure of satisfaction, success, peace or surprise. Human Design is a new kind of awakening. It is a process of coming to awareness that aligns our mind and body with their appropriate roles. It requires making an ally of the mind through understanding the mechanics of our design while simultaneously living our lives according to our Strategy and Authority. Once we understand the nature of the true self and the not-self, and are making life decisions from our personal Authority, we can release our attachment to the mind and its control over our lives, and free its incredible gifts to be of service to others. In doing so, we become aware and awake passengers, and our minds become objective observers of our life. Each individual’s singular path to awakening begins with a growing awareness of our sophisticated body’s heightened intelligence, and a deep trust in this intelligence to be our compass through life. We cannot, dare not, release our mind’s hold until we know we can trust ourselves implicitly. By fully trusting our own ability to navigate life, we become more accepting of ourselves, and able to genuinely love ourselves – and others. This, in Human Design, is the point of personal transformation – seeing through the illusion, and moving through life awake and aware.